blind men and elephant fish 맹인들과 코끼리 물고기: Zapiro nails it again. 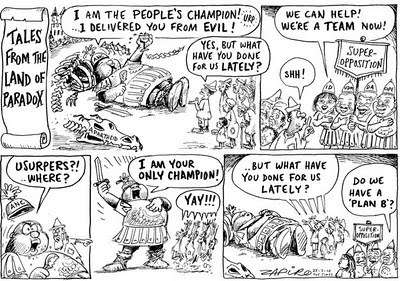 Zapiro is an icon of the South African press. Here is his latest. Its spot on. Not being familiar with South African politics, I'm not seeing the point. I see the guy with the sword has ANC on his helmet and the caps of the super opposition have something on their caps . . . looks like letters, but I can't make it out.